The kind of Internet connection your business uses can have a huge impact on your productivity, your level of employee satisfaction and your overall profitability. If you’re a business that relies heavily on the Internet for cloud services, VoIP telephony or heavy data traffic, then a fast, reliable connection is vital. This article looks at the two main options available to business today and reveals why fiber optic broadband comes out streets ahead of ADSL. The two main Internet connectivity options available to business are ADSL broadband and fiber optic broadband. ADSL (Asymmetric Digital Subscriber Line) uses the existing copper wire telephone network to transmit and receive digital data packages. Unlike its predecessor, dial-up Internet, ADSL does not limit data usage to either voice or data but allows for telephone calls and Internet usage simultaneously through the same copper wire. 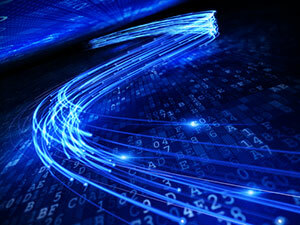 Fiber optic broadband, on the other hand, runs through its own dedicated fiber optic cable. This is installed either from the exchange to the business or from the exchange to the node, which is the junction box nearest to the business, after which it travels the rest of the way via the copper wires. Unlike copper wire, which transmits data via electrical impulses, fiber optic cable uses modulated light from an LED or laser to carry the connection through a series of fine, hair-like optic fibers. The infrared light impulses bounce along the inside of these flexible glass fibers literally at the speed of light. The two main advantages of fiber optic broadband over traditional ADSL broadband are the two things a business needs most; speed and reliability. The difference between ADSL, ADSL2 and ADSL2+ is all about speed. ADSL2+ is the maximum speed attainable from an ADSL connection, and this can be anywhere up to 24Mbps (depending on the connection) although it is usually much less than this – averaging around 8Mbps. Because fiber optic impulses travel at the speed of light, fiber optic broadband is much faster than ADSL, up to five times as fast in fact, or even more (anywhere between 30Mps and 150Mps). And unlike ADSL, where the further from the exchange you are the slower the connection speed, fiber optic speed remains virtually unaffected over long distances. And in a business environment where the connection is being shared by many people at the same time, this superior speed makes all the difference in terms of productivity. As well as high speed, a business needs to know their Internet connection can be depended on. It needs to be consistently reliable, with little or no interruption to service and a high degree of uptime. And fiber optic broadband is extremely reliable; much more so than ADSL. While ADSL broadband is subject to the whims of your ISP’s traffic congestion, interference from nearby electrical appliances, weather and other factors that can cause it to run slowly or drop out altogether, fiber optic broadband is highly stable. It is known as a passive system, which means it does not require an electrical current to operate. This means that if there is a power outage, you will not lose your Internet connection, unlike ADSL. It is also less susceptible to interference from power lines and high voltage electrical equipment, and is unaffected by climatic conditions such as static or moisture. And because the fibers are made from glass, your computer equipment will be less likely to sustain lightning damage in the event of a thunderstorm. Of course, as with any system, there are minor drawbacks associated with fiber optic broadband. The main one is the price, which is higher than for ADSL broadband. This is because it is not as widely available yet, with fewer providers meaning less competition. Installation is also more expensive, as the new fiber cable must be physically laid. But as they say, you get what you pay for in business as in life, and despite the higher price tag, an investment in fiber optic broadband is a virtual guarantee of improved productivity, higher staff morale and more money in your pocket.